For federal contractors, it is not an exaggeration to say that performance evaluations are the lifeblood of the business. A less-than-satisfactory evaluation in the Contractor Performance Assessment Reporting System (CPARS) affects far more than just the agency’s assessment of performance on a particular project. A negative evaluation follows a contractor around – impacting the ability to obtain future contracts due to the specter negative past performance ratings. The good news for contractors is that the ability to challenge and – if successful – reverse negative CPARS evaluations is a quickly developing area of government contracting law. 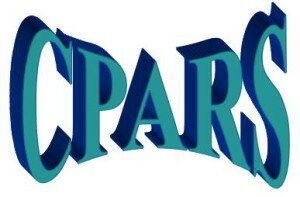 The first step in any successful CPARS challenge involves meaningful participation in the evaluation process. The Federal Acquisition Regulation (FAR) Part 42.15 entitles contractors to submit comments and receive an agency review of a disputed performance evaluation. Specifically, contractors are entitled to submit comments, rebuttal statements, and/or other information in response to the agency’s evaluation. 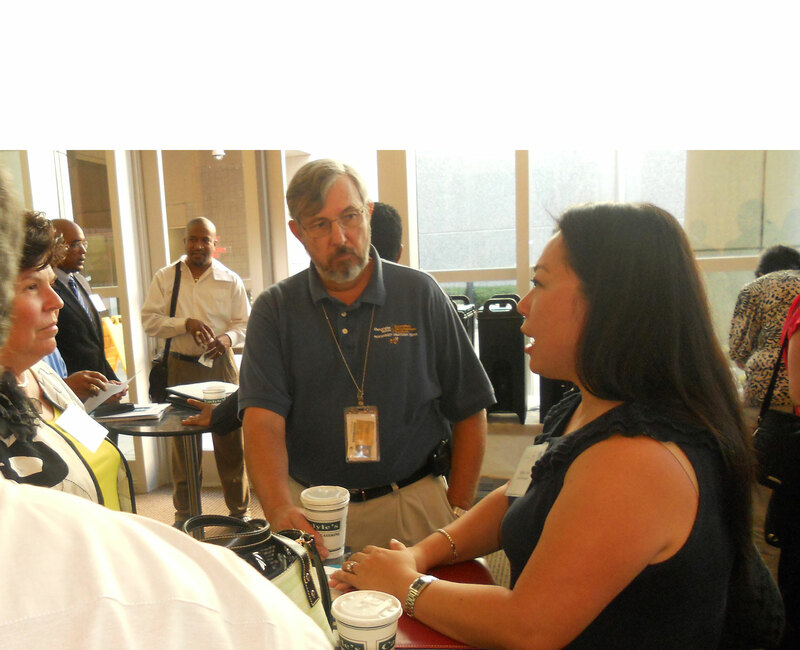 The agency must then review those comments at a level above the contracting officer and update the evaluation, if necessary. Even though the federal government maintains an entire agency whose mission is purportedly to assist small businesses — the Small Business Administration (SBA) — regulators seem ever oblivious to their impact on entrepreneurs. The National Labor Relations Board’s (NLRB) effort to redefine who is an “employer” and the NLRB’s and the Department of Labor’s (DOL) enmity toward independent contracting are two current examples. A third is DOL’s so-called Fiduciary Rule, which hits sole-practitioner and small-business investment and insurance advisors especially hard. Small businesses are also at a particular disadvantage when disputes with the government end up in court. A recent U.S. Court of Federal Claims decision, SUFI Network Services, Inc. v. US, exhibits government’s unfortunate willingness to exploit its power in disputes with a small business and the role courts can play in protecting entrepreneurs’ rights. SUFI contracted with the U.S. Air Force (USAF) in 1996 to be the exclusive long-distance-call service provider for the guest lodging facilities on Air Force bases in Germany. Over the next 8 years, USAF personnel made it impossible for SUFI to successfully offer services. For example, calling cards were provided to guests to circumvent SUFI’s service. Also, requests by SUFI that government phones be removed from the facilities were repeatedly ignored. SUFI declared that the USAF had committed a material breach of the contract and ceased services in August 2004. As required by the contract, SUFI filed a claim with its contracting officer for $130 million in damages. The officer awarded $133,000. Obviously dissatisfied, SUFI appealed to the Armed Services Board of Contract Appeals (hereinafter, Board), increasing its request to $163 million. The Federal Circuit’s decision provides clarity on the scope of Tucker Act’s bid protest jurisdiction, and provides a strong defense against Government arguments that attempt to limit that jurisdiction going forward. 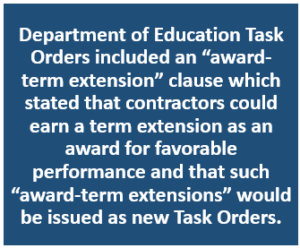 The dispute in Coast Professional focused on “award term extensions” to task orders issued through the Federal Supply Schedule (“FSS”). In 2008, the Department of Education (“DOE”) issued a Request for Quotations (RFQ) for services related to the collection of defaulted student loans. The RFQ stated that the Task Order would include a base term ending March 31, 2011, with additional option periods up to 24 months. 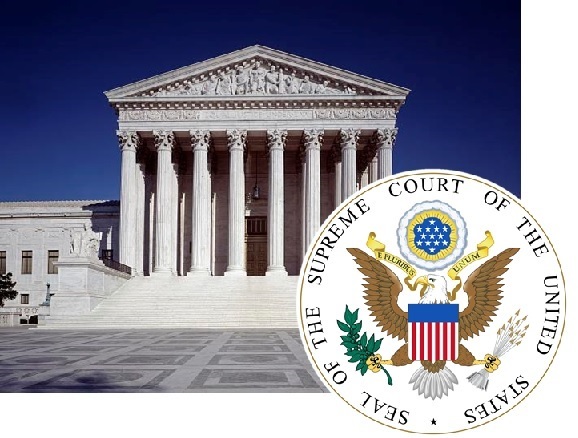 Today – June 16, 2016 – the U.S. Supreme Court ruled in favor of the interests of Veteran-Owned Small Businesses (VOSBs) and Service-Disabled Veteran-Owned Small Businesses (SDVOSBs) who challenged the practice of the Veterans Administration (VA) to not apply the veteran business preference to orders placed against GSA Schedule contracts. The issues involved in the Kingdomware case date back to 2006 when Congress first required the VA to restrict contract competitions to veteran-owned small businesses as long as there were at least two qualified VOSBs available to perform the work. This is known as the “Rule of Two.” In practice, the VA determined that this rule did not apply to orders the agency placed through GSA Schedules. The Government Accountability Office (GAO) decided that the VA’s practices violated the law, but the VA refused to make any changes in its GSA Schedule purchasing. Finally, in 2011, a SDVOSB company by the name of Kingdomware Technologies took the VA to court, but the U.S. Court of Federal Claims ruled against the GAO and in the VA’s favor. Kingdomware appealed, but lost at the U.S. Court of Appeals in 2014. One year ago, the U.S. Supreme Court agreed to hear Kingdomware’s case. On Feb. 22, 2016, the U.S. Supreme Court will be hearing oral arguments in a controversy that deals with whether federal agencies are doing enough to assure that their contracts go to businesses run by veterans, especially service-disabled veterans. You’ll be able to access live reports, a Twitter feed, and even a free webinar on the Court’s hearing. More about that in a moment, but first some background and information on why this case is so significant. The case dates back to November 27, 2012, when the U.S. Court of Federal Claims ruled that the Department of Veterans Affairs (VA) has discretion to procure goods and services from GSA’s Federal Supply Schedule (FSS or simply GSA Schedule) without first considering a set-aside acquisition for service-disabled veteran-owned small businesses (SDVOSBs) or veteran-owned small businesses (VOSBs). The Court of Federal Claims ruling represented a departure from several U.S. Government Accountability Office (GAO) decisions that stated the VA should comply with the Veterans Benefits, Health Care, and Information Technology Act of 2006 before conducting a GSA Schedule buy. The 2006 Act created the so-called “Veterans First” contracting program that gives priority to SDVOSBs and VOSBs in the VA’s acquisitions. Despite GAO’s opinions, the VA instructed its contracting officers to not apply the “Veterans First” principles to GSA Schedule contracting. The company bringing the challenge, Kingdomware Technologies, Inc., appealed the decision by the Court of Federal Claims. But the U.S. Court of Appeals for the Federal Circuit held that the purpose of the “Veterans First” rule is to ensure that the VA meets its SDVOSB goals, and that so long as the VA meets its SDVOSB goals, it is free to procure services and supplies from the Federal Supply Schedule without first considering a SDVOSB procurement. This lead the Kingdomware firm to take its plea to the Supreme Court. The U.S. Department of Justice urged the Supreme Court to deny review, contending that the Federal Circuit got it right. The Supreme Court nevertheless granted review. Then the VA surprised everybody. It abandoned the argument that the statutory preference for veteran-owned companies applies only if the VA has not met its SDVOSB or VOSB contracting goals. That position had proven to be successful in its arguments before both the Court of Federal Claims and the Federal Circuit. 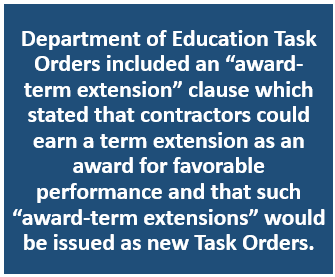 The government’s new argument was that the statute’s use of the term “contract” excludes orders under the Federal Supply Schedule or other multiple award vehicles. This new strategy by government lawyers puzzled Court watchers and federal contracting experts alike. The mystery of how this case would turn out got more murky. On Nov. 4, 2015 — just five days before the Supreme Court was scheduled to hear oral arguments in the Kingdomware case — the Court yanked the case from its docket. The Court directed the parties, not later than Nov. 30, to submit briefs on whether the contracts in question had been fully performed, and if so, whether full performance renders the case moot. Need another curious twist? While attorneys for Kingdomware worried that the VA would most certainly take the position that the case is moot, the brief filed by the government took the position that the case is not moot. 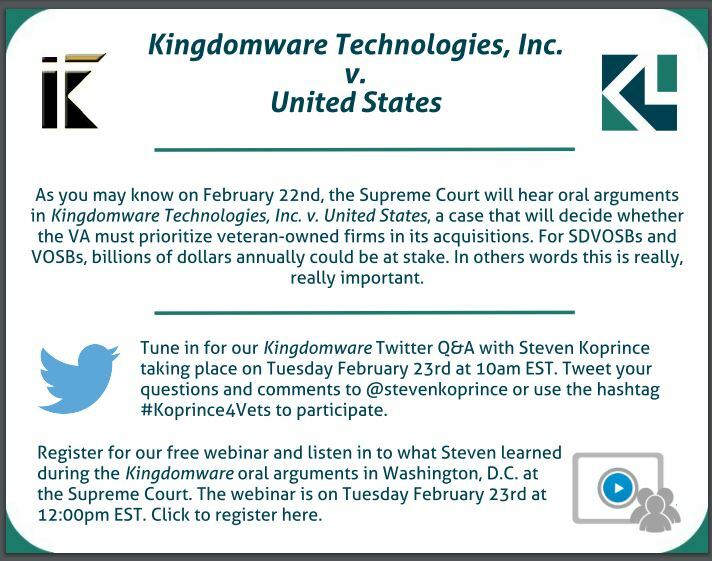 In response to the briefs, the Supreme Court announced, just before Christmas, that the Court would hear oral arguments in Kingdomware Technologies v. United States on February 22, 2016. Anxious To Learn about the Arguments Made to Supreme Court? Everyone who’s interested is small business set-asides, in general, and to extent to which the VA must prioritize veteran-owned firms in its contracting, specifically, wants to know about the arguments being made to the Supreme Court in this case. Posting his impressions on his blog, SmallGovCon, the afternoon of Monday, Feb. 22. You can check SmallGovCon.com that day or let him know if you would like him to email the post directly to you. Answering your questions posted on Twitter starting at 10:00 a.m. EST on Tuesday, Feb. 23, for a full hour. You can follow Steven on Twitter @stevenkoprince or use the hashtag #Koprince4Vets. Offering a free webinar to those who are interested in hearing what he learns at the oral arguments. Steven’s webinar will take place at 12 noon EST on Tuesday, Feb. 23. You can register for it here. 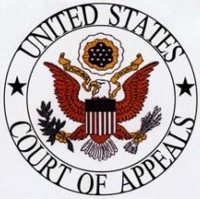 In a recent decision, the U.S. Court of Appeals for the Federal Circuit (“CAFC”) the supervising court for the Court of Federal Claims and the Boards of Contract Appeals, among others) clarified important legal principles concerning the federal government’s duty of good faith and fair dealing and its responsibility for differing site conditions. Metcalf Construction Company, Inc. v. United States controls disputes with the federal government and also provides authority and rationale useful to contractors in disputes with any project owner, public or private. In October 2002, Metcalf Construction, a small business based in Hawaii, was awarded a $48 million contract to design and build 212 housing units for the U.S. Navy on a Marine Corps base in Hawaii. Saying the project did not go smoothly is an understatement. Metcalf’s performance was hindered and delayed by unanticipated soil conditions and other issues made worse by the Navy’s failure to administer the contract fairly and according to its terms. By the time the Navy finally accepted the project as complete in March 2007, almost two full years after the original completion date, Metcalf had incurred costs in excess of $76 million — leaving the contractor with losses of approximately $27 million.